You have seen my style of analyzing a Horoscope and I can do the same for you. A detailed report will be made where every aspect of the Horoscope will be analysed deeply. Mahendra Singh Dhoni aka the Captain cool was born in Virgo ascendant with Moon sign Virgo itself. Dhoni was a football player before switching to cricket as a wicketkeeper and was relatively unknown till 2004 when he entered Indian Cricket team which was going through crises of wicket-keeper since the retirement of Nayan Mongia. It was Dhoni’s performance in India A tour to Kenya and Zimbabwe which attracted the attention of Kiran More which resulted in his selection in Indian team and soon he started to make an instant impact by his aggressive hitting and cool hairstyle. is also involved. 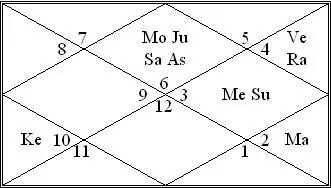 Venus is akin to yogakaraka for Virgo ascendant and here with Rahu in 11th house blessed Dhoni with great results. A parallel analysis using Jamini astrology indicates that Dhoni started Sagittarius Dasha in 2000 which lasted till 2008, zodiac Sagittarius is aspected by Amatya Karaka(significator of carrier) and is involved in Grand Rajyoga. We all know how all sudden Dhoni became a household name. It’s important to note that as per Jaimini Sutras Sagittarius Dasha can give an instant push to your career. In his chart Moon which is 11th lord , Jupiter which is 4th and 7th lord and SATURN which is 5th lord is making a Grand DHAN YOGA in ascendant not to forget 2nd and 9th lord Venus in 11th house along with Rahu and this makes him one of the richest sportsman on earth and he gets continuously featured in Forbes rich list every year. Mutual association of 2nd and 1st house with 5th,9th and ascendant is the biggest wealth yoga in astrology. As per Vedic Astrology, sports comes under 3rd ( courage and efforts) and 6th( winning in competitions) house and planets Mars(energy, passion, courage), Rahu (diplomacy, out of box thinking), Mercury(logic, analytical ability) and these should be strong and well placed. In Dhoni’s chart MARS the 3rd lord is in 9th house which is the most auspicious house in astrology and SATURN the 6th house lord is well placed in Ascendant, his Mercury is in 10th house of career which is also a strongest Kendra house and is making BHADRA YOGA and all features of Bhadra Yoga is present in his personality and all these factors makes him a super sportsman. He thinks out of the box, he arranged his fielding in the same manner like some general arrange his troops in a war field. His Rahu is with Venus(lord of 2nd & 9th) in 11th house and he came into highlight during Rahu Mahadasha. In short, he is blessed with certain abilities which make him a Legend of world Cricket. Dhoni got Captainship for 2007 t-20 world cup in 2007 and due to his strong luck and strong leadership India emerged as a winner and from there Dhoni’s career got skyrocketed in no time. During 2007 Dhoni was in Rahu-Jupiter Dasha and as per Jaimini, it was Sagittarius- Capricorn period. He got married in Rahu- Saturn period because Saturn is looking at his 7th house marriage. Then came the biggest night of his life when India won World Cup final on 2-4-2011 and during that time Dhoni was in Rahu-Mercury period and mercury is in Gemini in d-1 in 10th house, in d-9 it is in 7th house in Libra, in d-10 it is in 11th house and most important in d60R its in 4th house aspecting 10th house. But since winning the world cup in 2011 Dhoni didn’t enjoy the same kind of magical run and it is clearly evident in his Horoscope. After 2011 world Dhoni went into weak paryantars along with bad transits which were not bad but during 2012 his charisma and luck was kind of absent and Indian team performed badly because of which Dhoni was criticized, then during Ketu and now running Venus antardasha the story is same. Same time as per Jaimini he came out if his Glorious dasha of Sagittarius and Capricorn in 2012 and started Aquarius Dasha from 2012 which will last up to 2017 and his Venus Antar Dasha will last up to June 2017. As already mentioned above that Dhoni didn’t enjoy much success since after winning the world cup in 2011 and was involved in many controversies also. Now currently not only Dhoni’s Captainship but his role as a player is also under scanner and with Jupiter- Saturn transit in his 12th house, placement of Antar Dasha lord Venus in 8th house in d-9 & 12th house in d-10 and placement in 5th house which is 8th from tenth in d-60R is a deep indication of retirement in 2016-2017. With Mars Transit in Scorpio on Feb 20, chances of sudden injury is high. Early 2017 can bring some surprise decision and-and by end of 2017 retirement is sure for him. Next few month are very crucial especially transit shift of Saturn from 3rd to 4th house of his horoscope, which is happening in Jan end. Both Dhoni and Virat Kohli have Virgo Ascendant and temporary shift of Saturn in the 4th house will bring challenges for both of them, where chances of Virat Kohli getting injured is high, dhoni’s performance will take a dip for sure. Read double transit of Saturn-Jupiter here. 4th house is a house of throne and no doubt we will be seeing Virat in the position of Captainship but Saturn there will make him work hard and initial results may be disappointed for him especially from 26th of January. Dhoni got removed from Captainship of IPL team and it indicates the bad effects of Saturn transit from his 4th house. As mentioned the 4th house is the throne and in sports denotes Captain of a team and looks like the prediction of Saturn transit from his 4th house came true. Same time my predictions for Virat Kohli came also correct and we have seen how bad he has performed since January 26th, 2017. Interested in earning from betting on Sports email me on [email protected] your 5th and 11th house requires a analysis.